Haifa, Israel – While the world's media rightly focuses on high-profile crises in Syria and Egypt, another potential hotspot is bubbling up somewhat under the radar: the rising opposition to the Hamas regime in Gaza. Hamas is growing increasingly jittery having seen one friend after another disappear or desert the group over the last few tumultuous months. Now it faces growing internal dissent from the 'Facebook generation' through the rise of the Tamarod movement that contributed significantly to the fall of the Egyptian government this summer. Tamarod has already penciled in Nov. 11 – the anniversary Yasser Arafat's death – as the date for mass demonstrations in Gaza against Hamas. 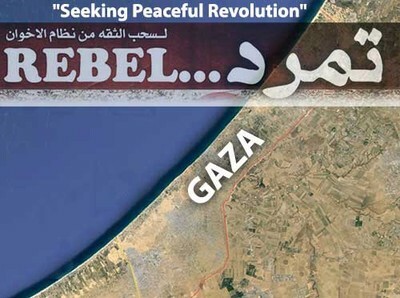 Unlike Hamas, the rebel movement vows to use peaceful protests to bring about change. "You [Hamas] won't rule after November 11 even if you finish us off" a Tamarod Gaza spokesman declared in an online video message. "All our options are open, except for using weapons. We are different from you. Unlike you, we don't use weapons against our brothers. Unlike you, we don't kill children, the elderly, women and youths. Unlike you, we don't destroy mosques. We will face you with bare chests." In the same statement, translated by the Bethlehem-based Ma'an News Agency, Tamarod Gaza declared, "It is time we rejected death forcibly under Hamas' pretext of security. Our people, regardless of their political and even religious affiliations, have been targeted by their criminality." As recently as June, Hamas – despite token gestures from President Morsi against their smuggling tunnels and activities in Sinai – could rely on Egypt's essential support, expecting the Egyptian Muslim Brotherhood government, (spiritually aligned to the Hamas doctrine and acknowledged as the parent organization of the Gaza terror organization), to stand with them on regional issues. That arrangement changed quickly in July. The Egyptian Tamarod movement gathered a reported 22 million signatures calling for Morsi to go. The Egyptian military – reacting to the groundswell of popular opposition driven by Tamarod to the democratically elected government – gave Morsi a 48-hour ultimatum to revoke controversial laws he had recently changed, but he refused. The military stepped in, Morsi was arrested, and his government fell. Hamas suddenly was without its biggest regional supporter. Qatar, Morsi's biggest financial benefactor, disappeared rapidly from the scene, and its promise to Hamas of up to $400 million of financial support has also been left hanging in the air. Iran is rumored to have reduced its financial support for Hamas in Gaza, and even Turkish Prime Minister Erdogan, Hamas' highest profile international advocate, has cancelled a planned visit to the enclave. In an interview published Wednesday by the Arabic-language Al Quds al-Arabi, Tamarod Gaza spokesman Qaws al-Barudi explained what is driving the fledgling movement. "Everybody knows how bad the situation of our people is. There is no electricity and no water, besides the ruin, unemployment, immigration, and the crisis of graduates, let alone the pitiful situation of hospitals," al-Barudi said. Hamas' failures threaten "the whole national project" for a Palestinian state. "We are not against HAMAS as a political movement as it is part of this people and a partner in the homeland. We are against those who practiced injustice and oppression. We are against the lords of [smuggling] tunnels and who make the homeland a commodity for trade through suspicious projects." The first signs of Tamarod spreading to the Palestinian scene coincided with Morsi's ouster. It is not confined to Gaza, but it also opposes the leadership of Mahmoud Abbas and the Palestinian Authority in the West Bank. The first Facebook posts reflected dissatisfaction with the corruption and cronyism of both Hamas and Abbas' Fatah party. There were small demonstrations in Ramallah in the West Bank in July. But it is Hamas that has come in for the lion's share of comment from Tamarod, and Tamarod Gaza – now with more than 46,000 followers on Facebook – has Hamas rattled and wondering how to deal with this new rising force. Tamarod likely has more supporters, but many haven't signed on publicly for fear of Hamas reprisals, Orit Perlov, a Tel Aviv-based expert in social networks in the Arab world, told the IPT. Discontent toward Hamas has risen since the Muslim Brotherhood's fall in Egypt. But Tamarod sees both Hamas and Fatah as illegitimate. Tamarod's success is due in part on its simplicity, Mohamed El-Sayed Abdel Gawad of Egypt's Almasry Studies and Information Center wrote last month. "The campaign took to the street and engaged with citizens directly, encouraged by earlier successes by youth movements that followed the January 2011 revolution." And its emphasis on peaceful opposition has helped "it to gain a favorable view among a wide spectrum of society." In a nutshell, that focus is the big challenge to Hamas. Aware of Tamarod Gaza's potential rise in popularity, Hamas has tried to neutralize the effect of the new movement. It has increased Internet censorship and is closely monitoring Facebook and Twitter activity. Hamas also has offered a number of anti-Tamarod theories, including that the movement is sponsored by the Egyptian military that overthrew the Muslim Brotherhood, and now, Hamas says, wants to interfere in the internal affairs of neighboring Gaza. In a video released to counteract the allegations, a Tamarod spokesman flatly denied that the popular movement is being sponsored and trained by the Egyptian military. He also re-iterated an earlier call for a huge popular uprising on Nov. 11. If it's not the Egyptian army, Hamas claims it's Fatah driving the peaceful rebel movement. "We are witnessing attempts by Fatah to instigate tensions in the Gaza Strip," a Hamas official said in a Jerusalem Post report. "Our people, who threw Fatah out of the Gaza Strip, will not be deceived by this new conspiracy." Fatah, Hamas' bitter rival, outraged the Gaza regime by publicly supporting Morsi's ouster. Fatah's resumption of peace talks with Israel also incensed Hamas, as did Fatah's call – seen by some as adding wind to the sails of the Tamarod movement in Gaza – to hold long overdue elections in Gaza this autumn. Travel permits for Fatah officials in Gaza recently have been revoked, and a senior Fatah intelligence officer, Mohammed Abu Diya, recently was arrested by Hamas in Gaza, accused of carrying documents that showed Fatah working with the Egyptians to implicate Hamas in civilian unrest in Egypt. "How can we hold elections under the current tense situation and while the negotiations [with Israel are] taking place with the goal of liquidating the Palestinian cause?" senior Hamas official Salah Bardawil asked. It is clear that Tamarod is not one movement but an amalgam of disenchanted Gazan youth groups opposed to the Hamas regime, representing a wide spectrum of interests from secular youth to rival Islamist fringe groups. "60 percent of people in Gaza are under the age of 25. Most of the social networks users in Gaza are very young, between 18-25 years old," says Orit Perlov. "35 percent of Palestinians actively use social networks, mostly Facebook, mostly in Arabic, and more women than men. The interesting part is that there is no call for any violence. It's more about rights and freedom." Comparing Tamarod Gaza to its Egyptian equivalent, Perlov believes there is still a long way to go before it can be seen as a genuine force for change. "They are very emotional and very populist. The leaders of social networks need to embrace them. It is not – at this stage – something that could be considered irreversible. It's more of a show saying to Hamas, 'You are not legitimate.'" Anyone hoping that any future success for Tamarod might lead to better relations with Israel will be disappointed. Many in Tamarod contend that Hamas is not doing enough in the fight against Israel. "We want Hamas to return to its senses, to its true path of resistance against the occupation [Israel]," a masked Tamarod spokesman stated. "We will not be silent any more. You can't silence us. You will not rule us." Tamarod (Egypt) has also called for the tearing up of the long-standing peace treaty between Egypt and Israel, and for the rejection of all U.S. foreign aid. On Thursday, it called on the Egyptian army to block U.S. warships from traveling through the Suez Canal on the way to the eastern Mediterranean in preparation for a possible strike on Syria. A spokesman further made it clear that being anti-Hamas does not mean the Gaza Tamarod movement is pro-West. "If you think that rejecting oppression and suppression means coordination with Western or Arab security agencies, you are suffering from many psychological complexes," he said in a Jerusalem Post report. "There is no real resistance [against Israel] and your [Hamas'] ostensible resistance is nothing but a public relations stunt."